A sad departure at the film’s outset. “I would need to be there.” Congratulations, you just volunteered. The #Sanskrit word for war? It’s all #Greek to me. “Dazzle them with the basics.” Standard methodology. “Maybe we should try talking to them before throwing a math problem at them.” Ha! This gravity switch is a #MindTrip. The #Kangaroo story is amusing. “What is your purpose on Earth?” Love the way she teases out this sentence. Good #Logic. “A logogram is free of time.” #Heptopod language. “Many become one.” The nations must unite. “It was meeting you.” Ian scored major points with that line. Final analysis: a thought-provoking “first contact with aliens” yarn that reveals the best and worst in humanity. Rating: 3 out of 4. A visual marvel with solid acting. The atmospherics trump character development. Trite ending. If a movie is only satisfactory for three-fourths of its running time, is it still a quality entertainment? Sure, but it’s also an egregious waste of potential. 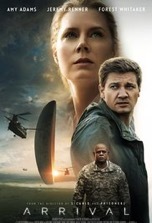 That last phrase perfectly describes Arrival since the first three-fourths of the film are taut, thrilling and saturated in mood and mystery, while the last quarter is an unwieldy, uninspired mess. To its credit, the movie doesn’t waste its time on drawn-out alien vessel appearances or FX fanfare sequences, like many alien assault flicks in the mold of Independence Day (1996). It’s clear from the outset that Arrival is a different kind of space invader film since it eschews the traditional action-packed opener in favor of a more moody and intimate prelude, introducing the first glimpses of the alien ship not in big budget special effects shots, but in streaky news footage airing on a living room TV. The story is infused with palpable tension as the military and scientists (never a good combination) scramble to determine if the recently arrived mother ships, which are presently stationed above a dozen random positions around our planet, are friendly or malevolent. Vital to the Save the Earth campaign is the inclusion of a communications cognoscente, but the world’s foremost authority on the subject has unceremoniously quit the project, presumably because his insurance doesn’t cover “Accidental Death by Space Aliens.” Rather than call or Skype the next qualified person on the list, Colonel GT Weber (Forest Whitaker, who is little more than set dressing in the movie) flies out for a face to face with the possible replacement and requests, rather than demands, that individual’s participation—apparently the fact that our planet can be blown to bits at any moment has no effect on the nerves-of-steel war dog. Fortunately for us, Dr. Louise Banks (Amy Adams) is available to join the global coalition of experts as her students haven’t attended her Linguistics class at the university ever since the aliens arrived (no dedication to higher education these days). 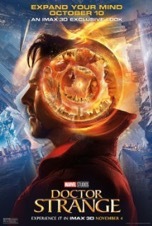 Louise meets theoretical physicist Ian Donnelly (Jeremy Renner) and the sparks immediately start flying, triggered in part by their English versus Math verbal sparring match and in part by their obvious attraction to each other. Louise and Ian are tasked with establishing communications with the aliens, a tall order since neither of them remembered to pack a universal translator. The team’s initial visit to the alien ship (a colossal, obsidian spheroid hovering vertically in midair like a supersized version of 2001’s monolith) is a mind-bending, nape-prickling affair that effectively captures what it must feel like to make first contact with a bizarre alien species—this movie features gigantic heptapods with petal-like proboscises that emit puffs of black soot which congeal into circles a la Gandalf blowing smoke rings in The Lord of the Rings: The Fellowship of the Ring (2001). The novelty of these alien encounters wears off with successive visits (why so many? ), but the intrigue heightens when our heroes learn the nature of the alien circles. So far, so good. Arrival, especially in the early goings, is reminiscent of The Day the Earth Stood Still (the original from 1951, not the schlocky remake with Keanu Reeves in 2008), which is widely regarded as one of the finest—and highly evolved—sci-fi pictures ever made. Though certainly in good company there, Arrival squanders its sure-footed setup with a standard, schmaltzy ending, particularly in how the earlier sparks between Louise and Ian are kindled into a full-fledged romance. This storyline feels rushed since the characters graduate from arguing co-workers to loving, dedicated parents in one convenient leap into the future. The jump in time is jarring and is further exacerbated by the fact that we learn very little about the star-crossed couple since the film’s otherworldly cinematography and alien atmospherics constantly overshadow what little character development can be found here (after all, the alien vessel is the star of the show). The flash-forward flubs also extend to the movie’s gimmicky resolution: side character General Shang (Tzi Ma) provides Louise with the solution to the alien riddle in a sequence so ridiculous it recalls the antics in Bill & Ted’s Bogus Journey (1991) where the titular twosome merely think of an action in the past that will thwart their adversary in the present. However, as awful as that story device is, the mishandled ending isn’t the only problem with the film. For instance, the aliens seem to comprehend concepts far more complex than “weapon,” so their nearly disastrous misunderstanding of the word seems more than a little contrived. Another narrative misstep is Ian’s out-of-the-blue voiceover narration midway through the film. Besides being overly expository, this narrated section is incongruous with the rest of the film and just feels odd since it shifts the POV away from the main character (Louise) and toward the secondary character (Ian). And then, to get really nitpicky, there are several story snafus, such as: how can a non-linear alien species know that humans will assist them 3,000 years into the future? Are they sure it isn’t 2,999 years from now? Or 3001? Further, why would these aliens even need our help since they’re so technologically advanced from us? Also, why do the creatures communicate with circles…seems a tad trite since we already associate (crop) circles with aliens, right? And how can Louise’s vision at the beginning of the film even occur since she doesn’t possess the capacity to look into the future at that point? Louise’s ability to gain knowledge from the future that will help us in the present which will preserve our future is a time paradox so convoluted it would give John Connor a migraine. These are niggling details, to be sure, but the sheer number of them reveals just how porous the plot is and prevents the movie from achieving maximum liftoff. Like a skilled magician, director Denis Villeneuve (Prisoners, 2013) has cleverly disguised his tenuous story with a style over substance sleight of hand along with an obfuscating display of temporal razzle-dazzle (in the Chicago sense of the word). In the end, Arrival’s arrival is well executed, but its departure needs some work. Good thing we have the next 3,000 years to get the sequel right.